India has plans of taking its economic growth to the next level, but for that to happen, access to quality, reliable and aff ordable energy is of utmost importance. Today, the country is seen as a potent market for renewable energy and this has been possible due to consistent support from the policy makers and other stakeholders. As the impact and role of renewable energy continues to grow, a plethora of new opportunities have come to the fore and the country has embarked upon numerous initiatives. 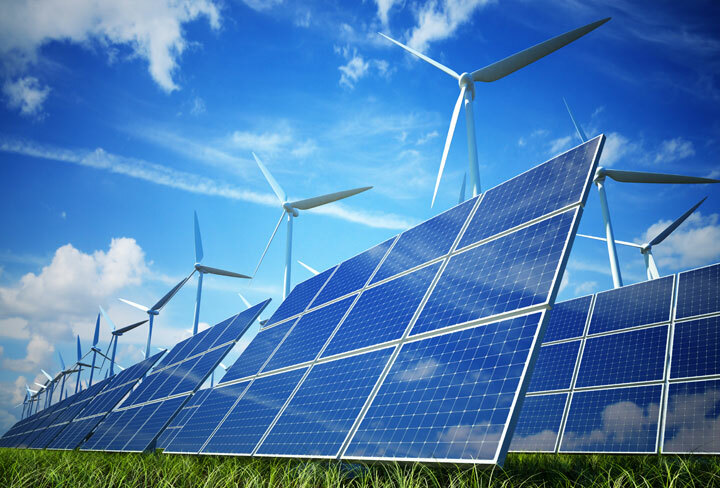 Renewable energy therefore, not only promises to be a good source of generating clean electricity by setting up power plants, but it also has its employability in various other sectors as well. Right from providing clean cooking systems to back-up power through rooft op solar panels, the role of renewable energy technologies (RETs) is making its presence felt in various energy-intensive sectors, viz- transport, agriculture, telecom, industrial heating, internal security environment and wildlife conservation to name a few. Th e advantage of negligible fuel expenses, very low operation and maintenance costs usually off set the initial capital costs of the RETs. Energy Next takes a look at the prospective use of RETs in diff erent aspects of life and the impact that it would have in the long run— both from the point of view of economic benefi t and climate change issues. ComSolar, GIZ and Ministry of New and Renewable Energy’s (MNRE) joint project under Indo-German Energy Programme on commercialisation of Solar Energy in Urban and Industrial areas, carried out a study to identify promising industrial sectors for solar energy technologies. The study resulted with the identification of five sectors as the most promising for solar intervention, including the textile sector, wherein it was found that if the energy replacement potential (ktoe/ annum) was 403, the estimated monetary savings would be ` 8,432 million per annum. It concluded that the textile (finishing) sector is one of the most promising, with regard to the use of primarily solar thermal technologies for various applications which are commercially attractive in terms of internal rate of returns (IRR) and payback-times. The commercial viability of solar technologies is much higher for industries using fuel sources such as furnace oil, coke or diesel. The Indian textile industry is believed to be the second largest in the world, also the oldest and largest sectors of the country, accounting for around 30 per cent of exports. Moreover, it is also the second largest employment generator after agriculture. At the same time, it is also one of the highest energy consuming sectors in India. About 23 per cent energy is consumed in weaving, 34 per cent in spinning, 38 per cent in chemical processing and another 5 per cent for miscellaneous purposes. Across the country, some textile companies are opting for renewable energies such as solar. One such instance is that of Jharcraft, which has found a visible change in production, by opting for solar power. The textile industry in Tamil Nadu is among the largest investors in wind energy and accounts for over 3,000 MW of captive wind power capacity out of the total 7000 MW in the state. Estimates of the capacity being backed down, (the wind mill power is not being utilised), range from 30 per cent of the capacity, according to the South Indian Mills Association (SIMA), to over 40 per cent as per wind energy associations. The textile sector has also been identified as a designated consumer by Bureau of Energy Efficiency (BEE). As per statistics provided by the Annual Survey of Industries (ASI), the primary energy consumption in the sector was 4.46 Mtoe in 2007-08. Textile processing steps range from singeing (removal of protruding fiber) to finishing and printing of the fabric and manufacturing, polyester, polyester filament yarn, acrylic, nylon, viscose, cotton, etc. Competition is fierce, hence reliable and affordable energy supply is crucial for this industry. Posted on February 22, 2014, in ARTICLES and tagged energy technologies, Renewable energy, renewable energy technologies, Solar energy, Solar Power. Bookmark the permalink. Leave a comment.